Famous For: Sikh pilgrimage, Spirituality, Indian History, Free public meal (Langar), Hospitality, sightseeing, and architecture. Entrance Fee: No visiting charge is taken. Foreigners can enter without paying any fee. Accommodation Charges: Rent for AC room is 1000 INR/day. Non-AC room’s rent is 800 INR/day. No money is charged for staying inside the hall. Operating Time: The gurudwara is open 24/7, each day of the year, including National holidays. Langar Hours: Only vegetarian food is served. Timings are tentatively from 9AM to 3PM & 7PM to 10PM. Visit Duration: there is no restriction on time-limit. Gurudwara Bangla Sahib, formerly the bungalow-sized residence belonging to Raja Jai Singh, was locally known as ‘Jaisinghpura Palace’. Later, his home was converted into a gurudwara. It was named after the 8th Sikh Guru, Guru Harkishan Sahib, as a tribute. It stands as a significant pilgrimage site for all Sikh devotees. 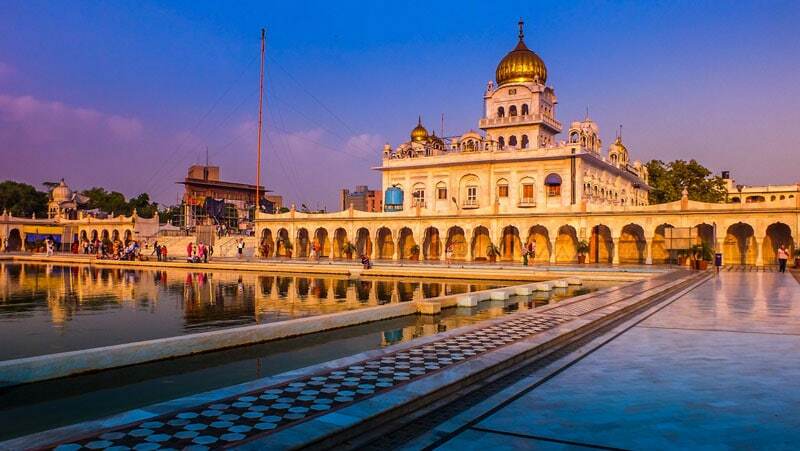 Located on ‘Baba Kharag Singh Marg’, close to Connaught Place, this golden domed gurudwara is visited by people of various religions, races, and nationalities. It comprises the main gurudwara, the Sarovar, the Yatri Niwas, and a school. Interestingly, there is one hospital, one museum, and also one art gallery, functioning in its basement. There are 39 AC-fitted rooms and 8 non-AC rooms. Each of these has an attached bathroom. There are 2 large halls that can accommodate about 500 persons, each. Keep your head covered with any scarf, dupatta, saree-pallu, or handkerchief when present inside the complex. Shoes are forbidden on the gurudwara campus. Leave them on a shoe rack available at shoe-counter, near its entrance. Wear clothes that aren’t supposedly revealing or indecent. Photography is prohibited within the gurudwara. Maintain silence when you are venturing inside. Keep vigil over and take care of your personal belongings. Attend the prayer sessions conducted inside, to gain spiritual experience. Book a room of your choice in the ‘Yatri Niwas’, for an extended stay. Get Karah (Holy) Prasad for yourself and your family. Eat langar with other visitors, in its dining hall. The langar’s menu includes chapaati, vegetable-based curry, dal, and kheer. Learn about various historical events of Sikhism by visiting the Baba Baghel Singh Museum & Art Gallery. Tour its Khalsa Girl’s School and operational basement hospital. Enjoy the surreal beauty of its on-campus ‘Sarovar’ during sunrise and sunset time. 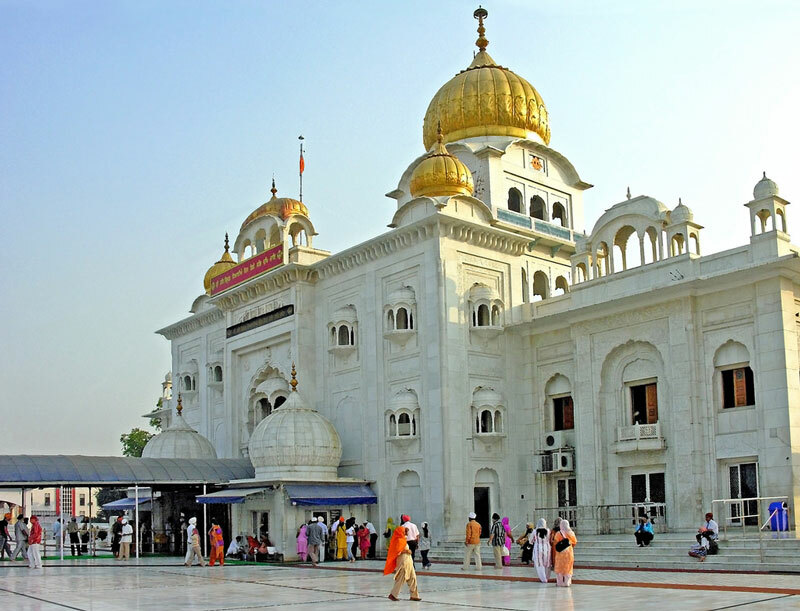 Hire a guide or get information about the place and other details from the gurudwara’s officials. Shivaji Stadium metro station (its Airport Express line), Rajiv Chowk metro, and Patel Chowk metro are the closest metro stations. However, you can take a stroll or a vehicle to reach this place from the metro stations. The ‘New Delhi Railway station’ is the only railway station nearest to it. Guru Harkishan Sahib Ji died of small pox, on 30th March, 1664 AD, here. He was seven-years-old at that time. Nishan Sahib, the tall flagship pole, is its landmark structure and visible from afar. You can volunteer to clean campus floors, serve in the kitchen, or take care of visitors’ shoes near the gate counter. Gurbani, religious hymns in Sikhism, is played all the time in the background. Gurudwara ‘Sarovar’ is an artificial lake and a home to many fishes. The ‘Delhi Sikh Gurudwara Management Committee’ or DSGMC established the basement-level charity hospital. It has a multi-storey vehicle-parking facility, cool drinking water facility, and clean public washrooms, on its campus. A basket containing head-scarves is placed near its entry point. Visitors can pick up and return back these scarves without paying a fee. Undoubtedly, it’s a great place to visit in Delhi, if you are interested in holidaying, spiritual ambiance, as well as, cheaper short-term accommodation. The splendor of this sprawling gurudwara complex and its tranquil surroundings will surely make your trip a memorable experience! It was seven years not seventy .. so please correct that..